This has been said many times before in more abstract ways, but it deserves to be stated distinctly. It is astounding how effective Ralph Lauren has been at selling a very particular dream over the past 45 years. This was my dominant thought during a tour last week of the Rhinelander Mansion in New York – Ralph Lauren’s beautiful flagship store. The tour, by the store director (a friend of a friend), was an opportunity for the two of us to analyse this perennial appeal, and in particular to consider how it has been retained despite the launch of several different brands in the past few years. I imagine that my emotional relationship with Ralph Lauren is rather like that of a reformed addict. I think I’m over it, that pulsating, acquisitive desire I had as a teenager, but as soon as I wander back into a store it hits me again: the wood panelling, the preppy brights and the worn leathers; that warm, spiced fragrance that always reminds me of shopping at Christmas. Suddenly I really want a cashmere sweater. Even though I know it will be reduced by 60% or 70% in the sales. Even though I know the designer outlets have them at that reduction all year round. It’s quite an achievement, overriding all my value-seeking instincts so utterly. But then this is a dream. One I deeply want to buy into. So many other brands do ‘prep’, but fail to turn that into the evocation of a dream. Tommy Hilfiger in New York works well, but doesn’t come across anywhere near as well in other stores. Abercrombie and Hollister are not selling anything like a dream, merely a fleeting, effervescent ‘cool’ that can evaporate as soon as you leave the store, and will certainly be gone faster any new Ralph Lauren brand. During a recent screening at RRL in London I didn’t get much chance to talk to the staff, but I noticed one was an old friend from Albam, which boded well. In New York this was confirmed, with a long conversation with one sales assistant considerably increasing my knowledge of raw denim, and a lot of the old construction details RRL includes in its jeans, despite them lacking any modern application. For example, the hidden rivets in the top corners of the rear pockets. Useful if you’re a worker using them to store tools, but not really required for modern man’s billfold. Black Label gets a far greater expression at the Rhinelander than in London. Its suiting room has very different colour palette to Polo or Purple – all blacks and pinks, sharp lines and Deco-era patterns. The casual wear is even starker and brighter. Not what you think of as Ralph Lauren at all. Yet the sense of the dream remains. RLX, the sports clothing line, was probably the biggest challenge in terms of brand extension. But there are also technical details here waiting to be discovered: a waterproof jacket, for example, that can withstand 70 pounds per square inch of water pressure. To be called waterproof, it needs to put up with 25. Gore-Tex fabrics are around 40. In an age when more and more men seek quality and value by buying from the original manufacturer – witness the retail launch of Drake’s and the increasing sale online through blogs or other editorial-driven sites – the only way to survive will be to sell a very powerful dream. 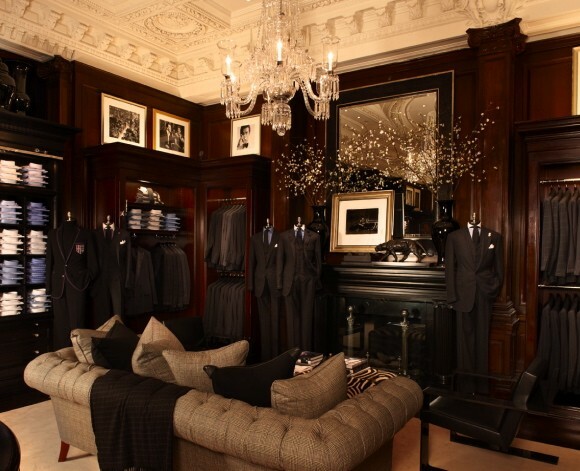 Ralph Lauren, from its age-defining menswear shop, is still doing just that. You can follow the discussion on Ralph Lauren: The enduring appeal by entering your email address in the box below. You will then receive an email every time a new comment is added. These will also contain a link to a page where you can stop the alerts, and remove all of your related data from the site. good post. One of my favourite brands. Not often that a mainstream label manages to keep their quality on par. It’s one of few designer “brands” that I’m actually willing to buy into. As a sales professional at the Ralph Lauren store (in Atlanta) it is very refreshing to see that a forum that I regualarly visit feels the same way about the brand that I work for, and love. It’s so easy to get caught up in with the “now” brands but Mr. Lauren has continued to give us that dream that we all can live the lives of the stores, the ads, the clothes. I hope you enjoyed your visit. Best. My family owned the “Rhinelander Mansion” up until the 1960s. Although not entirely used as a residence- it housed “Rhinelander Florists” for years-there was an apartment on the uppermost floor occupied by an elderly,beloved family domestic who lived out her final years there. My brothers and I tried to convince the family to restore it as a residence or to open a “Gentlemen’s Club”. Unfortunately, economics controlled and it was sold. When I first given a tour of the RL restoration I was so grateful it was done with such diligence and authenticity. My brothers and I saw our dream created by another and are grateful to RL for his vision and commitment to one of the few the surviving NY residences. RL is often excoriated for stylistic plagiarism, but, if he ever does such, he does it to perfection. Great reporting! Right on the mark. Best of the Big-Name Preppies. The only highly commercial brand that manages to maintain both perceived and real quality. Selling pedigree to haves and have-nots alike. That said, Ralph Lauren’s down-market CHAPS line (serious marketing mistake) left a permanent scar on the brand. Must be amusing to an Englishman that RL English Country House style is more ECH than an English Country House.